The Dancing Cat. 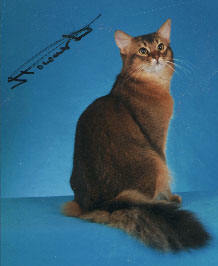 A mutation of the Abyssinian, the Somali was first bred in the United States in the 1960's. With shaggy body and tail it is an obvious Oriental breed. Colours come in red with bands of chocolate brown, ruddy with bands of darker brown or black, and blue with bands of darker blue. A moderate-sized cat with soft, medium-length fur and a bushy tail which has sometimes earned the cat the nickname "fox cat", also referred to as "longhaired Abyssinians", since Abyssinians are the "parent breed" of the Somali breed. A breathtaking cat to behold. It bears an uncanny resemblance to a little fox, with its large ears, masked face, full ruff and bushy tail. The Somali’s wild, feral look is what immediately draws fascinated attention. This cat will eagerly learn new tricks and loves the freedom of the outdoors. It has been said that the Somali is not an apartment cat, that they they can become resless and destructive. Somalis do very well as indoor-only cats, provided that they are given plenty of room to run and play. It must be said; in the outdoors, however, they are happy and resourceful. Shy by nature, the Somali is reticent about her affections and those on whom they are bestowed. While this is surely true of most cats, with the Somali it is especially true. Remember to keep her warm, the Somali is not a cat of cold climes. A true Abyssinian, she takes to the warm. Somali's are incedible at jumping what seem like impossible distances, they are the true gymnasts of the cat world. Somali's have the skills of the greatest and most skilled dancers, elegant, graceful and flexible. As the saying goes "The World is a Circus" and the Somali is at center stage! Be prepared to be highly amused at some of the antics of this miracle cat. This sweet-faced, lithe, muscular cat has an uncanny alertness is highly intelligence and has a keen curiousity. Tail and back arched, the Somali will run sideways like a monkey, and even hold objects and food the way a monkey does. Adept at opening cupboards and drawers, Somalis sometimes hide inside their secret areas. Many Somalis can manipulate faucets, and they love to play with water. Somalis have the tabby "M" on their foreheads, and display pencil-strokes of darker colour drawn out from the corners of their eyes. As the darker colour also rims their eyes, Somalis may look as if they're wearing eye liner. They usually have no white on them, other than white around their mouths and under their chins. They also shed very little, less than many short-haired cats. They have two seasonal moults in spring and autumn (USA: fall), but otherwise shed minimally throughout the year. Many Somalis exhibit what breeders jokingly refer to as the "hairdresser gene". For some reason, many Somalis seem to have a need to "dress" the hair of their human owners! Many Somalis will try to groom their owners' hair, beards, and moustaches, particularly if they are wearing any kind of hair-care product such as hairspray or mousse. Like Abyssinians, Somalis are generally quiet cats, with soft voices they don't use a great deal. Somalis are adept communicators, but don't rely on their voices to do so. They communicate with human family members through soft mews and possess a charming trill. This can be frustrating for breeders, as some few Somali females may have a "silent heat" (in heat but doesn't call). Buyers of pet Somali females should also be careful to have their female spayed as soon as she is old enough for this reason, so an inadvertant breeding doesn't take place. Somali females have been known to go into heat as young as five months. Somalis have gold or green eyes in all colours. Females are smaller than males, weighing about 6-10 pounds on average as adults. Males are an average of 10-12 pounds as adults, although some may be larger. The Somali coat colour develops slowly, and doesn't show its full, mature ticking and colouring until age 18 months. Kittens tend to be darker and less warm-coloured than they will be in adulthood. Somalis generally have longer hair over their chests (ruff) and on their hindquarters (breeches). Their tails are full and brushy, almost like that of a fox.